Make your very own CHEESE CRACKERS and save! ting in the kitchen with the kids and teaching them how to make their own crackers. Preheat the oven to 325˚F. Mix together the flour and salt. Then stir in the melted butter until cheese dough is firm. Wrap in Plastic Wrap & chill for 30 min. This makes the dough easier to work. Roll the chilled dough into long ropes. Cut ropes in 1/4 in. pieces. Bake each batch for 20-25 min. until lightly toasted on the bottoms of the crackers. Also make sure the tops of the crackers are firm to touch. Making this a fun activity for you and the kids ~ Teach your kids about measurements. Let them do the stirring and rolling. After you cut them out show them how to place them 1 in. apart on the baking sheet. Your kids will be proud of what they made. Ask your child's teacher if you can bring these yummy treats in for snack day. Include a recipe for the school so they can make it with the kids too! You can even print up cute cards with the recipe on them to send home with each student. Make a big patch of these up and make a party mix by adding peanuts, cheerios, pretzels and fruit bits. 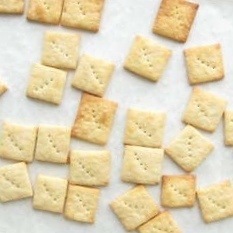 Have fun making and saving with these yummy Cheese Crackers! I couldn't find my photos. Sorry. These wonderful photos courtesy of Google Images. yum! will definitely try these! This looks great! Can't wait to experiment with the recipe and make some with my two year old...she LOVES dough! Show's how much I know. I had no idea you could do this yourself! When you get a chance, please stop by. I have something for you! These look great! I think I'll try them this week and make them with pepper-jack. Thanks! That doesn't sound too hard and would be fun to do.